Museums have always been cultural places of learning. Museums are increasingly bringing their walls down and reaching out to people, exploring different tools and strategies to keep pace and relevance to current times and audiences. Authenticity and relevance of the artifacts and the intelligence with which they are presented set museums apart, making them distinct memorable experiences. The process began with an assessment of the space, the artifacts, and overall objectives, scope and limitations of the project. This kind of immersion and a good understanding of the various aspects of the project feed a good brief. Our client had a collection of 50 cars, bikes and tractors collected over two generations. The objective was to showcase the history of cars, providing a highlight on six cars which were technical milestones, in the journey of 125 years. The message of the exhibition however was much larger than the Hispano Suiza, or the Rolls or even all the vintage relics put together - a celebration of human spirit and potential. 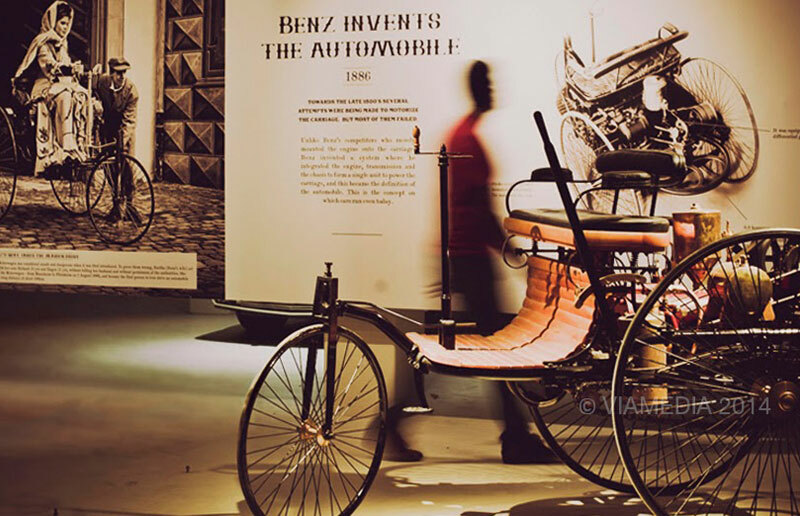 An exhibition that would showcase the cars of the past and unfold stories of visionaries and their innovation. A celebration of ordinary men with curious minds and great courage who believed their ideas could make a difference. Stories of success and of failure; that would inspire visitors and children especially to follow their hearts, to pursue their dreams and to keep doing, keep learning till they realize their dreams. The museum opens with a brief background on the evolution of automobiles from the wheels, to engines, to parts of the car and its basic working, before opening into the main car exhibits. A special effort was taken to briefly introduce the fundamentals of automobiles through interesting AVs, working models, etc to offer a good background and to set context to the exhibition for a first time visitor. As one descends into the vintage basement, the museum gently unveils a grand history - of success, war, failures, milestones, imagination and hope that grows onto you. A journey that is timeless, yet evolving. ‘The History of Cars’ theme promised a comprehensive experience – one that would be educational and informative and most importantly one that would be inspiring. Designing for the museum was a continuous, cyclical process of exploring, prototyping till it evolved into its refined form. It was a complex process and involved the interactions between various stakeholders, management, architects, designers, lighting designers, vendors, etc. The walls of the basement were scraped, treated and restored to heighten the vintage experience. Light washes on the stone walls provided a rustic background to these vintage jewels – bringing the beautiful and smoothly shined cars into focus. The material palette was a careful balance of old and new. New age materials were introduced with the flooring and display systems. A ramp and lift were made available for physically challenged and elderly visitors. The power consumption of the existing space from the tubular battens used in the space was over 4kW. With the proposed lighting design solution of ERCO’s LED luminaires, the power consumption could be brought down to less than 2kW, resulting in energy savings in excess of 60%, led by lighting expert Dr. Amardeep Duggar. The easiest approach would have been to present technical data but that would have appealed to a very tiny audience. The museum had a larger vision to appeal to a commoner and hence it was critical that artifacts were presented in a way that was fresh and accessible. That content be kept simple and easy and effortlessly bring out history to life. The artifacts were organized in chronological order starting with the First Automobile 1898, to the style conscious 20s, 30’s, 40’s, the fabulous 50s, the muscle car 60s, all the way to the 90s. Technical details were gathered and carefully curated alongside interesting facts, drawings, photographs, anecdotes, etc. Content hierarchies were built to engage the curiosities of different visitors. Various touch points were proposed to add play to the experience including projector walls, photo booths and design installations made from automobile scrap. The museum would also be a wonderful learning space, opening opportunities for partnerships, with schools, colleges and auto groups for the ‘out-of-classroom learning space’; a space that the local community could actively participate in. Also opening up a small exhibition space within the museum for other motor exhibitors to participate seasonally, motivating local visitors to come back. Today, platforms like Facebook and Twitter provide an opportunity for visitors to indulge in conversations, discuss and socialize around the cars, even after they have left the museum. Opening channels for user feedback would be key in helping the museum understand its visitors better. The biggest challenge was for design to break the local taboo of museums as boring historical places of unsung heroes and artifacts and transform it to a celebratory experience that would exciting and memorable. The artifacts may reflect a history of over 125 years, yet carry a strong message to inspire the future.